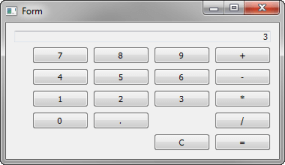 Calculator uses Qt SCXML to implement the Calculator Example presented in the SCXML Specification. The state machine is specified in the statemachine.scxml file and compiled into the CalculatorStateMachine class. The user interface is created using Qt Widgets.